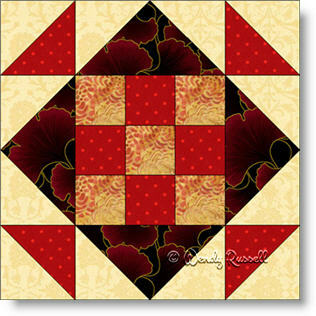 The Nine Patch Road quilt block is a wonderful introduction to the nine patch block, as it contains a nine patch inside another nine patch. This quilt block is a great beginner block, containing three different units -- the square, half square triangle and the flying geese patches. Playing around with colour can give you a totally different look. By changing up the background fabrics, you can achieve very different quilts, as illustrated in the sample quilts shown. Sashing between the quilt blocks offers another chance to separate the blocks or add an additional fabric.